I don't even remember when it actually started. I know I can go back and search for a first post or try to put my finger on when I first tweeted my blog through social media. However, I am not sure that gets to the bottom of why I even started on this journey to begin with. We can each answer the when but can we each answer the why? Blogging for me has been a rocky relationship. Some weeks and months I feel like I have so much to share and grow from by putting my experiences in writing. Then there are weeks, months and even the past school year in which I hardly wrote at all. There was guilt for not writing. Disappointment at times. I was not modeling everything I had encouraged others to do. I stepped back. Stayed quiet. I was trying to redefine my place. As the school year went by and the seasons passed, my reflection on the year unfolding was getting louder. While I had stopped writing and posting, I hadn't stopped growing. I gave myself permission to step away from blogging. It wasn't until this spring that I found some answers and realized I needed to go back to the beginning of my journey. I needed reminded of my why. June passes and now into July. The Compelled Tribe (a group of educators from across the country) were given a task and a challenge of sorts by writing to a prompt, a shared topic. We asked them, and therefore I ask myself, "Why [do] We Tribe?" Our suggestion for your post this month is to use the power of reflection to move forward. 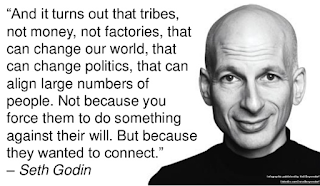 Simply, "Why We Tribe". Each of us has committed to this group for one reason or another. Whether we are writing and reading as suggested or fall short due to the realities of life, why are we here? The goal is to tell our story and recommit to the group. Hopefully this post will encourage just that! Now I find myself sitting here today gearing up for a new year, new challenges and many new faces. Relationships continue to grow and knowledge continues to expand. I find myself eager, yet scared. It sets in. It all comes back to the question that motivated and inspired me along with so many others to get into the world of blogging to begin with years ago. It answers the question. I am re-discovering my "why". While simple by words, it is not always simple to see. The reality is that it is our Tribe that is at the core of our why. And it is our Tribe that reinforces our reasons for blogging, reflecting and growing. ... gives us an open and honest platform to REFLECT in our practice. Therefore, we get better at our craft. Our PLN is transparent and does not judge. Reflecting on what we do is essential to grow forward. ... is about RELATIONSHIPS first and foremost. When we find our tribe and commit to them whole-heartedly we grow. We live the model we preach in our school districts and in our classrooms. Relationships are at the foundation of everything that follows in teaching, learning and leading. Our tribe reminds us of this daily. ... provides an opportunity for each of us to RECOGNIZE our strengths and weaknesses. It is this group of people, our community, our tribe, that helps us see what otherwise we may be unable to recognize on our own. No rose-colored lenses here. Just honest feedback and an opportunity to expand who we are. ... energizes and REENERGIZES our passion for the work that we do. We all stumble and we all have days that are harder than others. The tribe is always there. We stand with each other in our best of times and our worst of times. We feed off the stories of each other. The tribe brings the energy. ... gives each of us the opportunity to REJOICE in our work and the work of others. The power of the professional learning network is more than a passing moment. Connecting with others and sharing our story is part of our growth and our way to celebrate the work of others. We rejoice in what we see in others. There are thousands of bloggers in all aspects of work and life. There are hundreds of educators that take the time to write about their journey. And many of them are better at their craft than me. I am content being a small fish in a very large pond. At the end of the day, being a part of a tribe and many different tribes at that, it is what allows me to grow in what I do each and every day. Whether my tribe is the building I serve and the community within, the district leadership team I am blessed to be a part of, the Compelled Tribe of educators from coast to coast, or my family at home, it is the experiences of each of these that allow me to give to others and therefore answers my why. My why is my tribe(s). And for that, I am grateful. Why do you Tribe? Check out what Seth Godin says about finding your tribe.